At Amavas promotions on Monday, Nargis was seen wearing a green Raw Mango kurta and matching pants with jewellery from Aquamarine and Shilpsutra juttis. You’ll remember Soha wearing the kurta as a dress here and Rani with a dupatta here. Having seen all three, I prefer the combo where it is a traditional kurta with dupatta. Which version do you prefer? 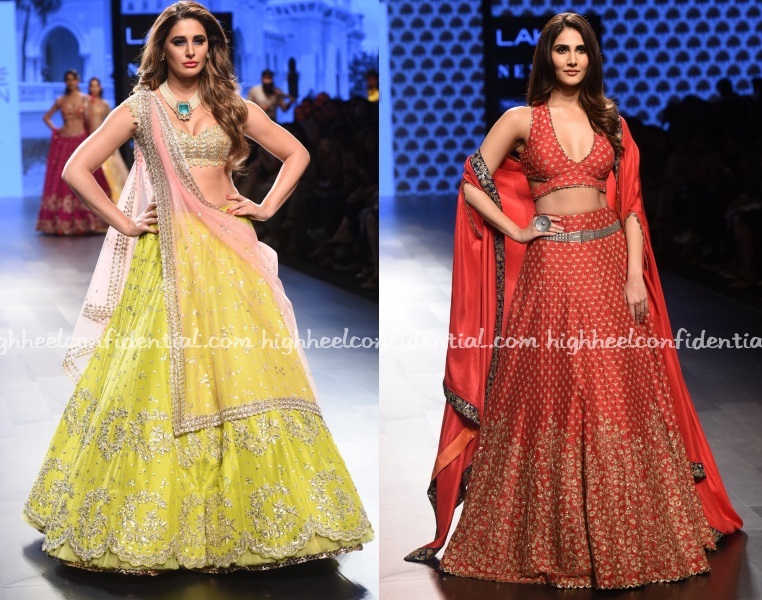 Nargis, who we’re seeing after a long while on these pages, attended the trailer launch of her movie wearing a printed Punit Balana anarkali and dupatta. She sure looked sweet but can’t help but think how formulaic this outfit of hers is. It’s almost like re-enter Bollywood zip code, must wear anarkali+jootis+jhumkis. I really would’ve preferred it if she’d kickstarted it with a more Indo-fusion or contemporary look. 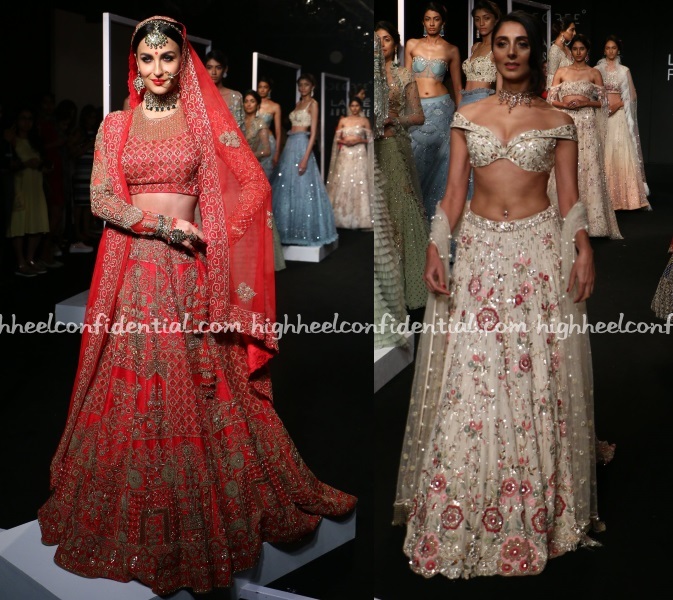 At a press conference announcing her as a face of a brand label, Ms. Fakhri was seen in a beige Abhinav Mishra anarkali and Needledust jootis. I wish there was some color added by way of jewellery or the jootis becasuse it does wash her out a bit. 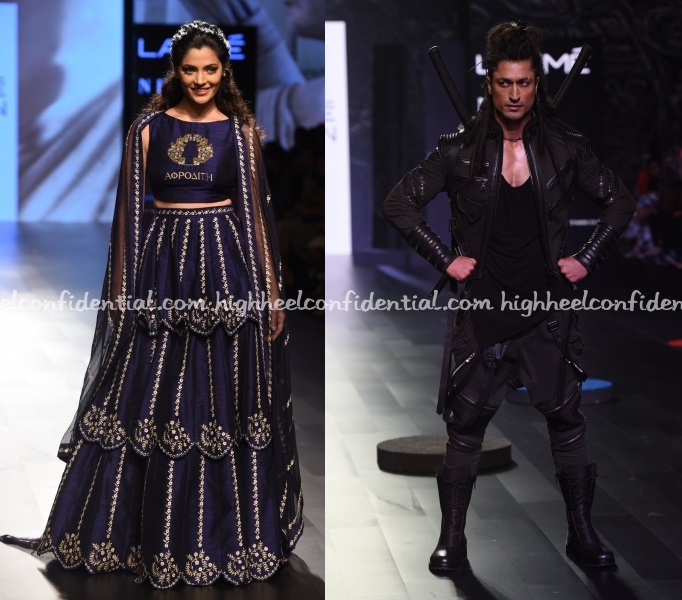 Day four of Lakme Fashion Week didn’t lack celebrity showstoppers and while the ladies all sported lehenga, lone man Vidyut sported an edgy warrior look. At the IIFAs, Nargis was photographed in an oxblood Gauri And Nainika gown. Wearing her hair up, she rounded out the look with a pair of hoop earrings from Isharya. We are glad Nargis let the décolleté be and resisted the urge to add a sheer panel as some are wont to. It might be tad too risqué for some, but we had no complaints; she owned that gown. Nargis looked good.